Consisting mainly of studio recordings laid down during the extraordinary 2011 sessions for Heroes, Willie’s Legacy debut, Willie Nelson and the Boys (Willie’s Stash, Vol. 2) is produced by Willie’s longtime friend and collaborator Grammy-winning Buddy Cannon and recorded by Steve Chadie at Pedernales Recordings Studio in Austin, Texas. Musicians on the album include Willie Nelson (vocals, Trigger), Lukas Nelson (vocals, electric guitar, resonator guitar), Micah Nelson (vocals), Mickey Raphael (harmonica), Kevin “Swine” Grantt (bass), Bobby Terry (acoustic guitar, electric guitar), Jim “Moose” Brown (piano, B-3 organ, Wurlitzer), Mike Johnson (steel guitar), Tony Creasman (drums), Barry Bales (upright bass on “My Tears Fall”) and Lonnie Wilson (drums on “My Tears Fall”). “Move It On Over” featured background vocals by the Spur Of The Moment Singers: Buddy Cannon, Mickey Raphael, Kevin “Swine” Grantt, Bobby Terry, Jim “Moose” Brown, Mike Johnson, Tony Creasman, Melonie Cannon, and Shannon Finnegan. Born in Austin, Texas and raised in Maui, singer/songwriter/guitarist Lukas Nelson entered the music scene as a youngster and, by the age of 13, had joined his father Willie Nelson’s band, touring as rhythm guitarist and honing the stagecraft that lead to his own career. Moving to Los Angeles, he launched in own ensemble, Lukas Nelson & Promise Of The Real (POTR) in 2008; POTR served as Neil Young’s back-up group on The Monsanto Years album and subsequent tour. Lukas and his father worked together on Willie’s 2012 Legacy album, Heroes, which featured a number of father-and-son vocal-and-guitar duets. Micah Nelson has performed with a variety of artists at events including FarmAid, Neil Young’s Bridge-School Benefit, Desert Trip festival, Lightning in a Bottle, Coachella, Bonnaroo Festival as well as on TV shows such as Conan O’Brien, Jimmy Fallon, Jimmy Kimmel and more. Micah has been involved in the ensemble Insects vs. Robots, recorded and toured with Neil Young and made multi-instrumental contributions to the 21st century post-modern American rock band Promise Of The Real. Micah is currently the singer/songwriter/guitarist in his future-folk project Particle Kid. 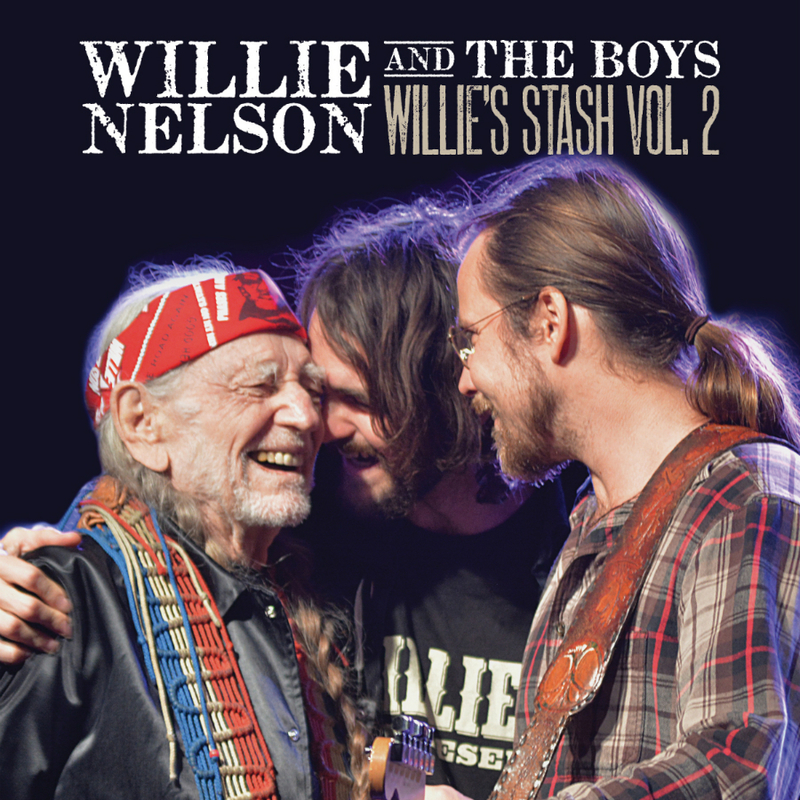 Willie Nelson and the Boys (Willie’s Stash, Vol. 2) is the artist’s 10th release since signing to Legacy Recordings in 2012. His last Legacy album, God’s Problem Child, was released on April 28, 2017 (the eve of Willie’s 84th birthday on April 29) and promptly entered the Billboard Country chart at #1, making it the artist’s second US country chart-topper in less than two years; Nelson’s 6th Legacy release, Django and Jimmie, an unforgettable musical collaboration with Merle Haggard, debuted at #1 on the Billboard Country chart in June 2015. Summertime: Willie Nelson Sings Gershwin, Willie’s 7th Legacy album, took home the Grammy for 2016’s Best Traditional Pop Vocal Album. That album debuted at #1 on both the Top Current Jazz chart and the Top Traditional Jazz chart following its release in February 2016. Willie Nelson has reached No. 1 on US album charts with his Legacy titles Band of Brothers (2014, #1 Country), Summertime: Willie Nelson Sings Gershwin (2016, #1 Top Current Jazz and #1 Top Traditional Jazz), God’s Problem Child (2017, #1 Country). In February 2012, Willie Nelson entered into an historic new record deal with Legacy Recordings, the catalog division of Sony Music Entertainment, marking a label homecoming for Nelson, who, from 1975-1993, had cut a phenomenal string of top-selling singles and albums for Columbia Records, beginning with 1975’s seminal smash Red Headed Stranger. New titles by the artist under the Legacy imprint will include newly recorded songs and performances as well as archival releases, personally curated by the artist, drawn from all phases of his career including his recordings for RCA Records and others. God’s Problem Child, his 9th album for Sony/Legacy entered the Billboard Country chart at #1, making it the artist’s second US country chart-topper in less than two years. Nelson’s 6th Legacy release, Django and Jimmie, an unforgettable musical collaboration with Merle Haggard, debuted at #1 on the Billboard Country chart in June 2015. Nelson’s third Legacy album to break into the Top 10 pop charts, God’s Problem Child was Willie’s first album to debut all-new songs since Band of Brothers (his 4th Legacy release) reached #1 on the Billboard Country chart (and #5 on the Billboard 200) in June 2014. Summertime: Willie Nelson Sings Gershwin, Willie’s 7th Legacy album, took home the Grammy for 2016’s Best Traditional Pop Vocal Album. That album debuted at #1 on both the Top Current Jazz chart and the Top Traditional Jazz chart following its release in February 2016. Since signing with Legacy, Willie Nelson has sold more than 1 million albums for the label.